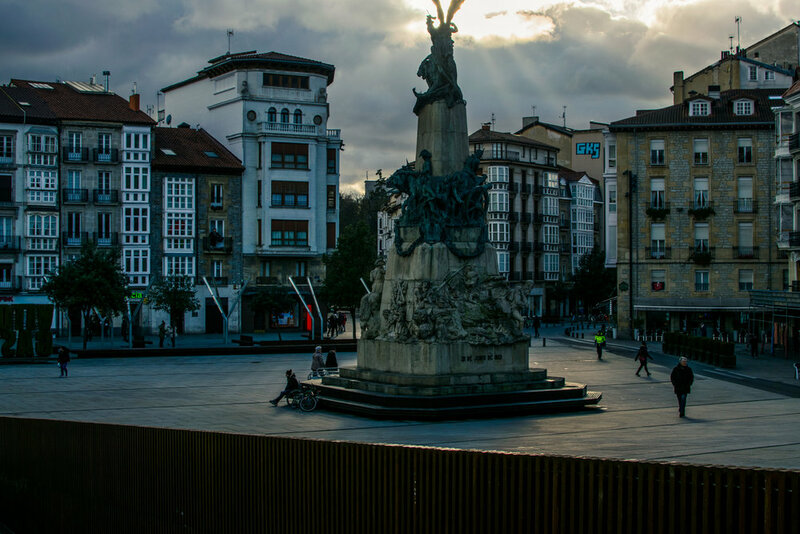 In a roughly one hour drive or two hour train from Bilbao, you can be in Victoria-Gasteiz, which makes Victoria-Gasteiz a perfect day trip from Bilbao or Getxo. It is also possible to see all the sights of the historic part of the city in one day. I didn’t because I wanted a reason to come back. 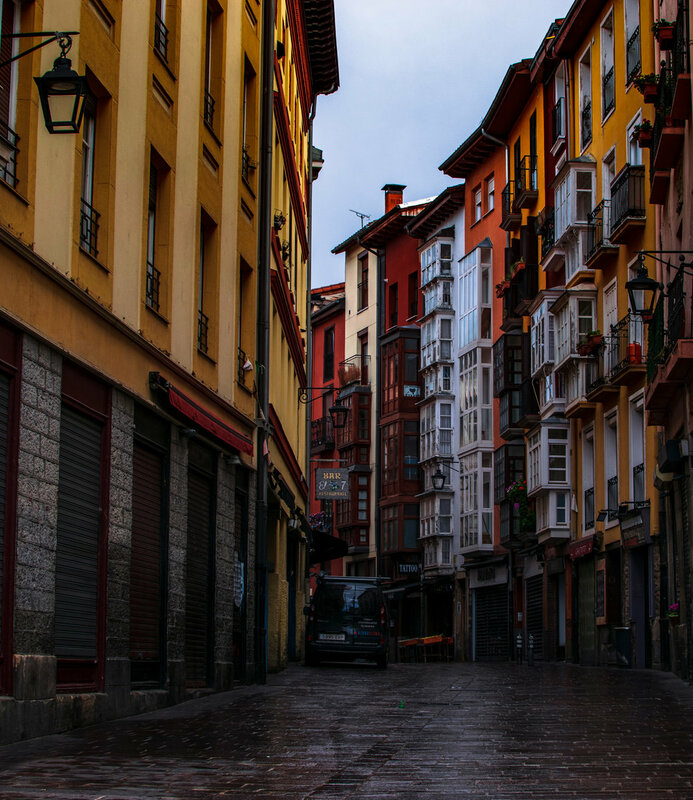 Victoria-Gasteiz is the capital of Basque Country and in the state of Álava, Spain. At the foot of the Pyrenees Mountains, the geographical border of Spain and France, Victoria-Gasteiz developed into a significant trading city during the medieval times because many traders stopped here while crossing the border. Hence, many of the streets in the historic area are named after different trades. For example, some of the roads are Kalle Zapatería, Pintorería, and Cuchillería. Another nice thing about the city is how easy it is to navigate due to it being an oval. If you take the train into Victoria-Gasteiz, the entrance of the old town is a straight five block walk. Take Eduardo Dato street if you want a direct route to the visitors center and Plaza de España. Here you can get a map of the city and start exploring. For the more adventurous soul, take San Antonio street and be greeted with Plaza de la Virgen Blanca. From here you can start exploring on your own. Victoria-Gasteiz is also a passing city on one of the routes of the Camino de Santiago. Once I found my way to the Plaza de la Virgen Blanca, I became fascinated with taking photos of this statue near Iglesia de San Miguel. This one was my favorite, despite it having little flaws to the picture. It had just stopped raining, and the sun was beginning to creep out again. After walking around without a particular agenda for the day, I began to search for the best place to eat. I first went to the tourist center where I asked what streets might offer the best "Menu del Día." A typical way of eating here in Spain. The Menu del Día is a fixed price meal with three courses, wine, and bread. Each round will also have three or four different options, and the last dish is a desert. The lady at the tourist center recommended four different streets I could find something to eat. After checking out all four lanes, I decided to go to a place called Maria la Gorda. I highly recommend this place if you find yourself passing through Victoria-Gasteiz. 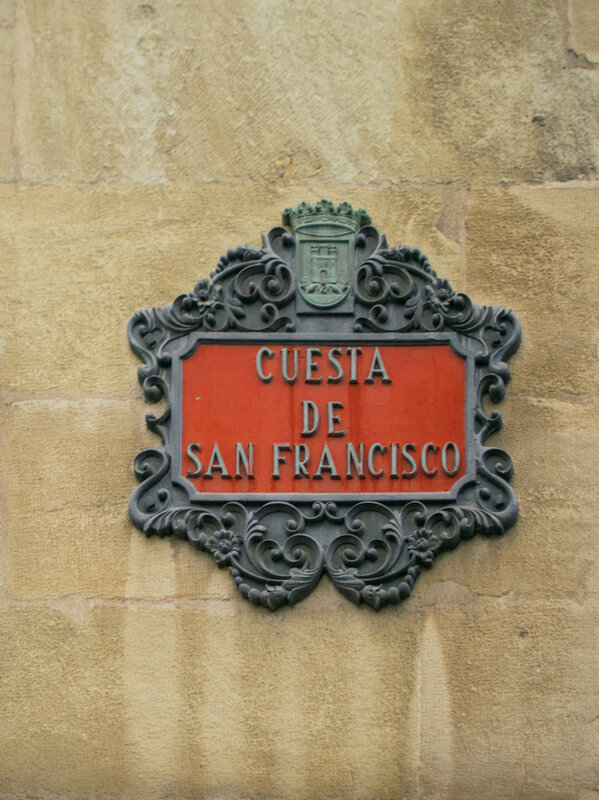 Funny enough, it is located just past Cuesta de San Francisco on Pintorería. After walking around for a few hours, I was starving. I needed carbs to make it through the rest of the day. I was so hungry I forgot to take a picture of my monster piece of lasagna that I order for my first course. Or maybe I was just busy drinking wine and finally eating. The lasagna was fantastic and came with a spicy red aioli to top it off. Yes, it was a blogging fail. For my second course, I ordered steak and french fries. Accompanying the French fries were traditional Basque sweet red Espelette peppers. Additionally, there was another hot green aioli to dip the steak or chips on the side. For dessert, I order my favorite dish here in Spain, Arroz con Leche. In the middle of the bowl, there was also a small scope of ice cream, and cinnamon sprinkled around it. Everything was delicious and I asked to take a photo of my server and the cook for the blog. After eating, I wanted to find Catedral de Santa Maria. Unfortunately, it is currently under construction and it this point of the day mostly everything was closed for the lunch hours. I also had to return at 6 p.m to meet with Carmen. So going inside anything was out of the question. So I started wondering again. Luckily, there is still a lot to see. Near the cathedral are the two murals, "El Triunfo de Vitoria" and Al Hilo del Tiempo. After seeing most of the old town, I figured I would check out the Parque La Florida and Catedral de María Inmaculada. On my way, I realized there was a fantastic view of Catedral de Santa Maria at Palacio de Villa Suso, and the light was perfect. After spending a while taking photos of the Catedral de Santa Maria, I continued on my journey to the park and Catedral de María Inmaculada. Inside I took in the sights and only snapped a few pictures of the stain-glass windows and the grounds. With an hour to spare and tired from the day, I figured I would head back to the meeting spot and get a drink.